What if, and bear with me on this, all of Wade’s crazy is what’s actually keeping him in check? What if his raging insanity, the constant stream of voices and ideas that flow unchecked through his cerebellum, are the only things that allow him to maintain a fragile hold on his, and that of all the heroes around him, reality? If that were the case, imagine what would happen if someone, who governed entirely by self-interest and an overwhelming desire to conquer this, and every other, world, tried to “cure” him, and in doing so stripped away everything bar the cold, clinical, overwhelming madness that allows our “hero” to see the truth of his surroundings? 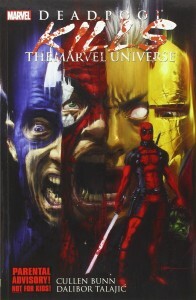 Then imagine that Deadpool, the one fed by a singular, driving voice urging him to break free of the constraining embrace of his “world”, was let loose, and the only way for him to escape was by killing everyone and everything that made his Universe what it was, and is? Sounds kind of scary doesn’t it? Scary, but, you know sort of fun at the same time. Well folks, that’s exactly what happens in the fourth wall shattering, ultra-violent, darkly humorous and murderously delightful Deadpool Kills the Marvel Universe.